Do you know how to paint like a pro? Posted: Thursday, July 24, 2014 5:30 pm |Updated: 5:47 pm, Thu Jul 24, 2014. Some people find painting relaxing and rewarding with a refreshing outcome, while others find the task daunting and don’t really know where to start. Knowing some basics and a couple tidbits of advice can go a long way toward a successful end product. Primer must come first over unfinished surfaces. It’s designed to seal the surface so paint isn’t absorbed into drywall paper or plaster patches. I skipped priming over spackle holes on a section of wall that had more than a handful of holes from dartboard mishaps, and it was an absolute waste of time. I went over the area three times with wall paint and finally caved and primed the area before the finish looked right and the color held true. Let’s roll in one more tip that seems like common sense. Clean and de-gloss the surface. 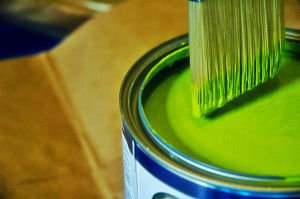 Paint can’t stick to shiny or dirty surfaces. Use a fine-grit sandpaper, but if abrasion isn’t needed to smooth a surface, TSP (tri-sodium phosphate) is cheap and works wonders as a cleaner. According to our friends at wikipedia, “TSP breaks the gloss of oil-based paints and opens the pores of latex-based paint, providing a surface better suited for the adhesion of the subsequent layer.” Gotta love it. Buch notes that there are other products sold as de-glossers that work as well. Sheens are a big deal. According to Buch, flat paints are for ceilings or primer, except in bathrooms, where mildew is an issue. Paints listed as “eggshell” are tricky, because even though there is a slight sheen, Buch says they’re “plasticy” and can’t be cleaned up. Buch prefers a matte finish. It’s somewhere between flat and eggshell, but it can be scrubbed. “The molecules are tighter, so dirt can’t permeate the surface,” he says. Satin and semigloss, Buch says, are for kitchens and baths, including ceilings, and trim. To get clean lines around trim and along ceilings and adjacent walls of another color, it’s well worth the time to tape off the area to protect it from fresh paint. Painter’s tapes are rated for their release quality, which tells you how long you can wait to remove it without damaging the surface. Some are three-day release, while others are 14- to 60-day release, ideal for extensive projects or slow DIY painters. Common sense goes a long way. Cover baseboards and floors with newspaper or a brown rolled paper to catch spills and avoid additional cleanup. (Plastic drop cloths don’t work because they don’t absorb, and paint can be tracked elsewhere. Remove or cover furniture, take off cover plates and put a piece of painter’s tape over the actual switch or receptacle. Color samples at stores can be daunting. It’s not a cop-out to use the already-suggested combinations of colors that most paint manufacturers provide. However you pick your colors, it’s never a bad idea to purchase a sample and paint it on the intended surface. That lets you see it in the light of your home during various times of the day. Remember that it’s just paint. Express yourself, and after a couple years, you can re-express yourself with another color. Humidity and moisture, in general, make for slow-drying paint, especially when painting exterior areas. Sun can dry paint too quickly and not allow it to adhere properly, creating a peeling issue sooner rather than later. Paint in the shade. Keep the roller wet with paint. And don’t go back over areas that have already started to dry, or you may pull at paint that has started to adhere to the wall. Buch swears by thinning paint to help it flow better. “If you can put a stick in the can and it stands up, the paint is too thick,” he says. “I pour off half a gallon and, for a latex paint, slowly pour some water in. If it creates a hole in the surface of the paint, it was too thick. Usually 6 to 8 ounces of water works in the half-gallon,” he says. Paint thinner does the same for oil-based paints. The roller’s nap will determine the texture that is left on the wall. A 3/8-inch will result in a smooth, light-texture finish. For a thicker texture, use a 1/2-inch-nap roller. With a plethora of information on the Web, Buch suggests checking out his and other websites for general information about paint and painting, including educational guides to the chemical compounds of painting materials, and how they work and why.